There are three main components to the event: We invite participation, attendance, and celebration from community members and visitors of all cultures and ages, both Hispanic, and non-Hispanic in Inyo County, portions of the 395 corridor, and beyond. Discover what the events are all about. Learn about the Altar making contest. Some tips & links to get your creative juices flowing. Your time, material, skills or money are gratefully received. using arts and crafts, music, dancing, foods and beverages, flowers and costumes. In the USA Dia de Los Muertos events and festivals are very popular, cross‐cultural, and held annually in many cities and communities. Relevant merchandise is available for purchase in mainstream stores and catalogs. Many art and cultural museums and venues host Dia de Los Muertos related exhibitions.The contextual focus of the Lone Pine Dia de los Muertos Festival is to celebrate, be educational, and promote diverse cultural and creative participation. We will outreach to the public within the Lone Pine community, and the greater Inyo County and “395 corridor”. The festival will be of interest, offer entertainment, and serve to bring culturally - and age diverseparicipants and visitors into our community and businesses. The festival will include various Dia de Los Muertos-related components including arts, crafts, decor, food, beverage, vendors, ofrenda exhibits in town locations, music, dancing, costumes and face painting. On October 31st during Lone Pine’s Trick or Treat, we will be having an art walk featuring Ofrendas (altars) that the community have created. We will offer workshops to assist people in making them . 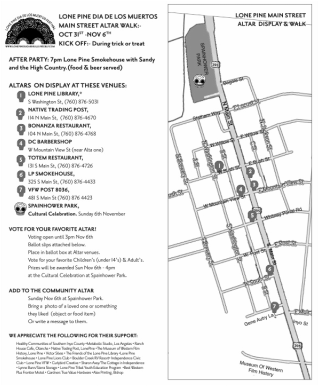 Your ofendas will be on display, hosted by businesses in Lone Pine from October 31st until the Cultural Celebration on Sunday November 6th. The public will vote and prizes will be awarded . Ofrendas (altars) are at the heart of the celebrations and are created in remembrance and honor of the beloved. especially marigolds, favorite foods, sweet bread, whimsical folk art and caricatures in the form of skulls and skeletons, provide some of the final touches. popular in private homes as well as in public places. The entire family work together in the decoration; much the same as Americans who decorate a Christmas tree together. The altar provides a feast for the visiting spirits. Favorite items of the person being honored are displayed on the altar. Traditionally, on November 1 ~ the day honoring children ~ altars are filled with everything in miniature: toys, chocolate, little glasses of milk & candies. 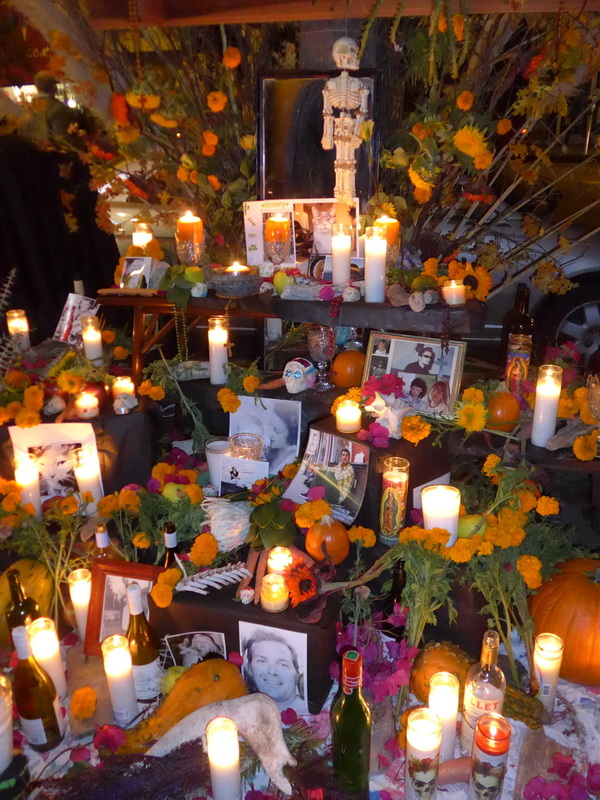 On November 2 ~ the day honoring adult spirits ~ cigarettes, mezcal, bottles of soda, stacks of handmade tortillas, pan de muerto (a rich egg bread which is either decorated or braided), special turkey in mole sauce, nuts, tamales and special personal items of the muerto (like a hat or piece of jewelry) adorn the altar.